We had a very relaxing Good Friday, so wore a really casual outfit. It was nice and warm still, which is just what you want on a long weekend. I wear blue and pink together a lot, so thought I'd be a bit different and wear blue and purple together. I liked it, what do you think? Hope you are having a lovely Easter break. I couldn't let it go by without sharing this video again, one of my favourite songs. It sums up beautifully why Christians celebrate Good Friday and Easter Sunday. Last worn: stripe top, denim shorts, purple thongs, Rebecca Minkoff MAC. 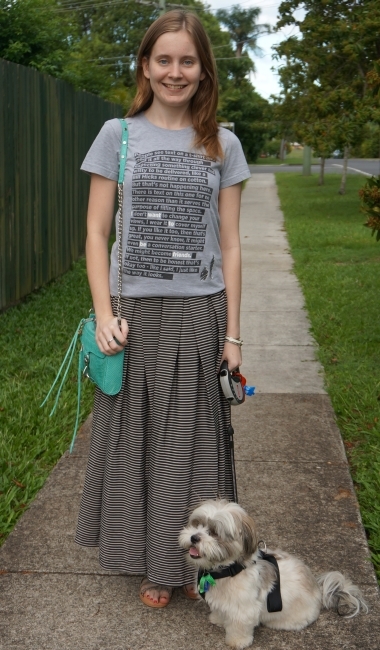 After being bitten badly by mozzies the past few days I opted for a maxi skirt today to try shield more of me, haha! This tee is one of my favourite Threadless tees, it may even be one of the first I bought. You can see a close up of the text here. In one of my wardrobe clearouts I gave it and a few other tees to my sister. When she had a wardrobe clearout recently, I got it back! :) We also discovered that I had given her a tee and then ended up buying myself a replacement for it, but I'm sure that will come up another day. Can't remember the reason I gave this one away, but I'm glad I got it back and it has a funny story behind it now. Last worn: striped maxi skirt, Asos sandals, Rebecca Minkoff mini MAC. It's the first time I've worn the tee on the blog. Love the blue and purple, love the maxi skirt + tshirt combo. Blue and purple are always a pretty color combination. So sorry you were bitten Mica. Sounds horrible, but at least you had a pretty skirt to cover up with :) Have a great Easter! Thanks Kim! The mozzies always go for me, haha! your pleated striped maxi is so pretty - just the perfect shape! I absolutely love maxi skirts and t-shirts. Definitely a good look on you. I wore something similar in a recent post. I love maxi skirts in the summer...we have a big mosquito problem too! Thank you for visiting, sweet friend. I love the Threadless tee - I have several of them that I wear for working out or around the house. The maxi skirt is fantastic! 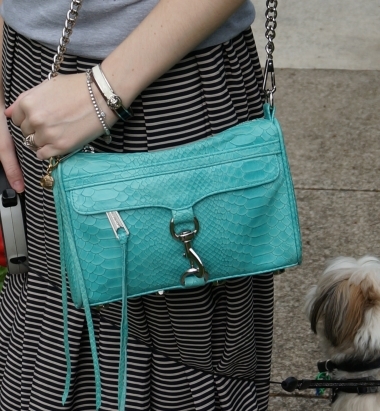 I love that teal bag too. I really like that maxiskirt!!! The black RM is gorgeous!! Happy Easter!! You look so cute. I love your use of colour especially in your bags. Happy Easter to you and little Cooper! 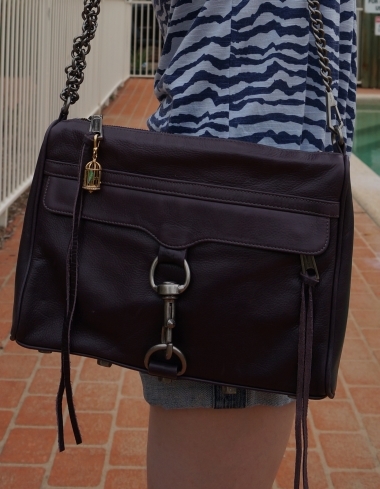 We love the rebecca minkoff bag and have been eyeing it for some time. keep up the great work hun! you always have the most amazing bags in the world! Such adorable outfits! you look so comfy but cute at the same time, LOVE your style! that maxi skirt looks AWESOME! wow im just loving that maxi skirt!! Loving that maxi you are wearing so awesome .